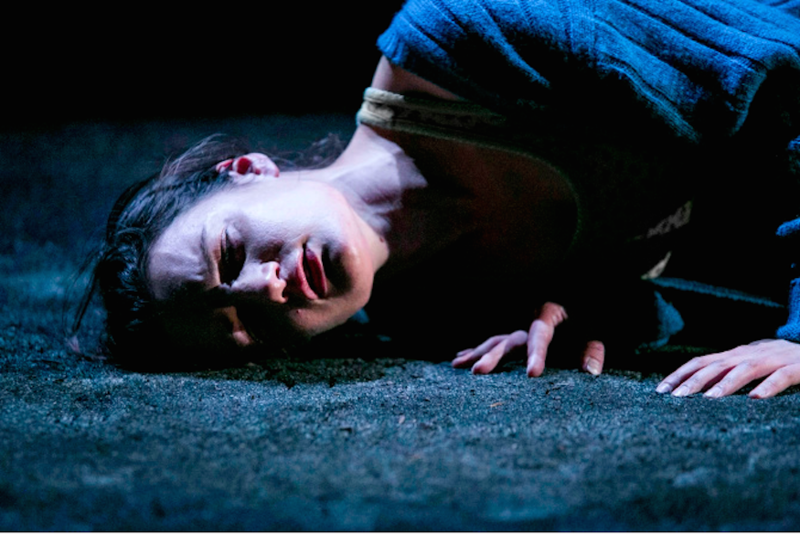 If you found yourself reading Eimear McBride’s award-winning debut novel A Girl Is a Half-formed Thing aloud to untangle the mass of competing voices, then you’ll appreciate Annie Ryan’s stage adaptation in which Aoife Duffin delivers a seamless performance of the text. We were worried McBride’s writing, with its disorientating, stream of consciousness style would be lost in translation on the stage. The fragmented dialogue, half-finished sentences and shifting locations could easily have been clumsily executed and awkward to watch. They aren’t. Annie Ryan’s sensitively constructed script retains all the poetic fluidity of the original. Released from the confines of the page, McBride's language is thrown across the bare stage to an audience who hang off every word and movement. We're gripped from beginning to end. Yes, the story is bleak. Through the eyes of a young, un-named female protagonist we're offered an unflinching portrait of what it’s like to grow up in Ireland with a terminally-ill brother and an overbearing mother in a strict Catholic family. We witness the worst aspects of humanity — sexual abuse, violence, alcoholism, paedophilia. It left us emotionally exhausted — that, we were prepared for. But surprisingly, in the midst of depravity, there is humour. The intensity of Duffin’s performance, in which subtle shifts in tone or idiosyncratic gestures indicate a new character is forming, is a triumph. It is refreshing to see a woman so command the stage and audience as Duffin does — yet all the while eluding our grasp as she glides between characters. This is more than a story of female victimhood. The girl is acutely aware of her surroundings, she speaks her own narrative despite the presence of those who wish to manipulate and exploit her. Ultimately the multiple voices she embodies shows how we are all moulded by forces beyond our control. The slightly claustrophobic space of The Maria Theatre emphasises the feeling that the girl can not escape the dark set of circumstances she finds herself in. It's at times uncomfortable to watch, yet impossible to look away. Don’t be surprised if you find yourself tearing up at this one. A Girl Is a Half-formed Thing is on until 26 March 2016 at The Young Vic’s Maria Theatre, The Cut, Waterloo SE1 8LZ. Tickets are £10-£25 (plus booking fee) and can be bought online in advance. Londonist saw this production on a complimentary ticket.